It’s not often we can praise the many gigantic SUVs on the road today. So when we got a chance to spend some quality time with one and became thoroughly impressed with it. We had to share. 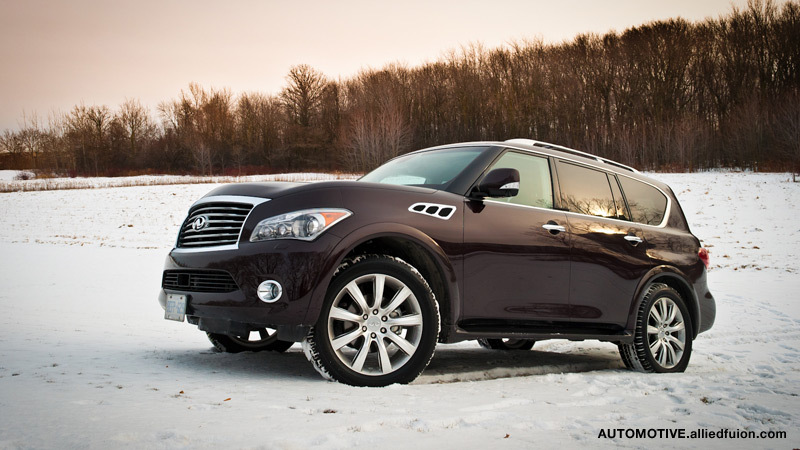 Infiniti’s QX56 is the largest vehicle in the luxury auto maker’s lineup. Built on the same platform as the not-sold-in-North America Nissan Patrol – for those who aren’t aware, Nissan & Infinity are siblings – the QX56 is very much a truck that rides like a car. Well, at least a car that is almost a full traffic lane wide, and has got enough ground clearance to comfortably drive over curbs. For the discerning luxury SUV buyer, there probably isn’t much in way of comfort, style, and opulence the QX56 doesn’t offer. So pucker up, and let’s get cozy with this beast. The QX56 comes standard with 22-inch alloy wheels, plenty of chrome accents – à la American style – and a front grille that intimidates all in front of it. Infiniti make very little attempt at making this big box on wheels aero-dynamic, and although the fuel-economy may suffer as a result, we couldn’t care less, this thing looks [email protected]$$. Our tester came in a beautiful dark purple-ish colour Infiniti calls “Dark Currant.” Call it what you will, but I think you’ll agree it looks phenomenal. 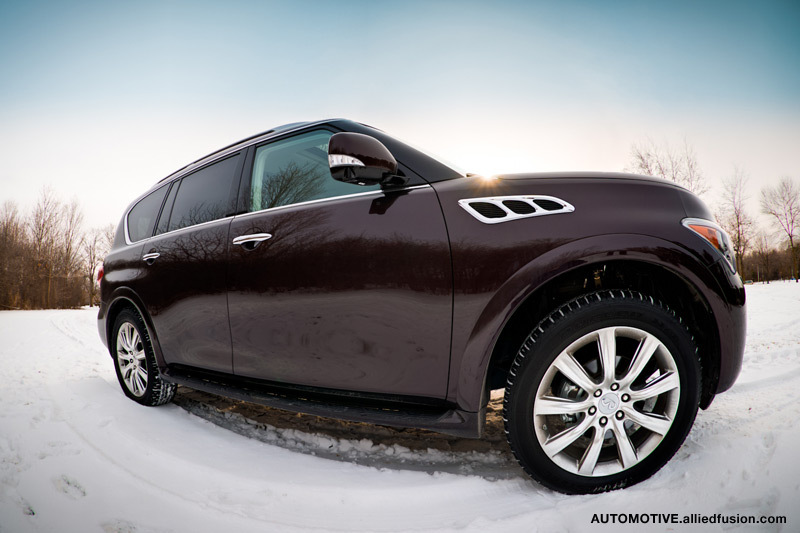 This SUV’s exterior focuses on a bit more than just style. The front and rear diffusers have been designed to allow for zero lift allowing it to handle better at higher speeds, while the big wing mirrors have been shaped to reduce wind noise. Even those beautiful chrome lined vents on either the side of the engine-bay are fully functional. On the inside the QX56 exudes luxury. Soft leather wraps every bit of the cavernous interior; while the use of beautifully marbled real wood is quite stunning. As with any modern luxury vehicle, knobs and buttons are plentiful, but Infiniti does a good job of laying everything out in a manner that allows easy access. I once heard someone describe the QX56 interior as “sitting in a beautiful hotel lobby, but you’re driving” – I whole heartedly agree. Powered by a 5.6L V8 producing 400hp @ 5,800rpm and 413lb.-ft. of torque @4,000rpm the QX56 despite its size is no slouch, managing the 0-100km/h (0-60mph for those on the imperial system) in about 7.5 seconds. In the driver’s seat of a QX56, you’ll feel less like a driver and more something along the lines of a boat captain; ironic because the QX56 has a towing capacity of 3,855kg (8,500lbs,) enough for a sizeable boat. The SUV leans gracefully even in the sharp corners, while bumps and ruts on the road feel like nothing more than gentle waves on the ocean. Allowing for all this riding comfort is a system Infiniti call ‘hydraulic body motion control system’ – for a breakdown of how it works, Wikipedia’s got you covered – and it works like a charm. Steering inputs are easy, but feedback is barely perceptible. Braking is strong, and comes from large front and rear ventilated disc brakes, but don’t expect fade-free ceramic brake performance. The standard 7-speed automatic transmission shifts smoothly, although not necessarily quick. It should be obvious that the QX65 was not meant to be a performance driver’s machine, but then if that’s what you’re looking for, why are you reading about a big luxury SUV? Luxury is very much at the core of the QX56, everything is designed around that very premise. As a driver, you’ll be surrounded with it, and your passengers will thank you for it. Luxury vehicles are very much about toys, and the QX56 does not disappoint. Let’s start with our favourite: the around view cameras. At low – think parking lot – speeds, or when in reverse the QX56 can bring up an almost bird’s eye view of everything around the vehicle; and this is in addition to the regular backup camera most vehicles offer today. If you walk around the SUV and look carefully, there are a total of 5 cameras – yes, 5! – mounted strategically around the vehicle. The around view cameras allow a driver to manoeuvre this massive vehicle in to and out of all manner of tight spaces with ease. With the exception of a few other Infiniti models, there aren’t any other vehicles on the market that offer this kind of system today. This luxe SUV also features a lane departure warning system which lets you know when you stray out of your lane on the road. It also comes with a blind spot information system which lets you know if there’s another vehicle in your blind spot, great for those who fail at the simple shoulder check – note I am not saying this is a good alternative to shoulder checking, everyone should do it regardless of having a system like the one on the QX56. There’s also a frontal collision warning system that lets you know when you’re getting too close, too fast to the vehicle in front of you. Combined these three systems really ought to be called the focus-on-your-driving package. There’s a magnificent info-tainment system in the QX56 which comes with a 13 speaker Bose audio system along with an impressive 8-inch touch screen. Yes there’s live traffic information, iPod integration, Bluetooth, and almost every other tech option imaginable in today’s luxury SUV market; and most importantly, because this is a luxe SUV, all this tech is done properly and in quality. When driver and passenger tire of sitting on hot leather in the summer, this SUV comes with front seats that have vented cooling along with the more popular heated seats. Not only do driver and passenger have independent temperature controls, but passengers in the rear get to control their own climate as well. Infiniti have paid a lot of attention to ensuring that no matter where you sit in this big 7-seater (optional 8 seater), that you will be comfortable – although admittedly the 3rd row seats are really only for children or adults who drew the short straw. Infiniti really show their bones as a builder of high quality vehicles that are comfortable, stylish, and opulent with the likes of the QX56. 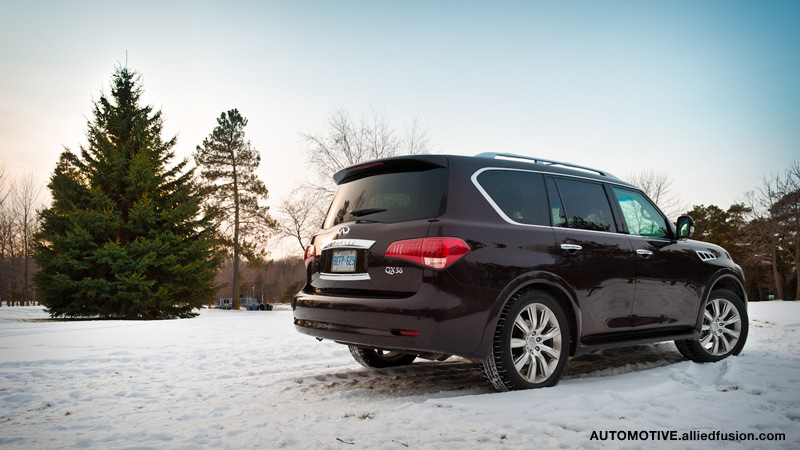 At about $81,000 our as-tested QX56 is not for the faint of pocket. Consider the almost scary fuel economy of a big 4×4 V8, and ditto to that last comment. Get in and drive the QX56 however, and somehow all those things melt away in to oblivion. Consider that the SUV’s like the QX56 won’t be here much longer – fuel guzzling V8 monsters are a dying breed – and suddenly this behemoth is a short lived wonder. Limited ownership means you get to be unique, and isn’t that what we pay $81,000 for? Not everybody needs a big SUV. Heck, even those who think they do, can probably do with a good mini-van. But need is not the reason you buy a QX56, you spend some time with it, and you realize that you want it… want it oh so badly. Photographs courtesy of Wilson Lo & Nissan Canada. Kanishka Sonnadara is a member of AUTOMOTIVE.alliedfusion.com and can be found on Twitter @autoKsS.